My sister loves nothing more than a good bush walk which made choosing a birthday experience for her fairly easy – we are a bit spoilt for choice in our part of the world. Of all the experiences I’ve given as a gift this year, this one was the most rewarding for both the gift givers and the gift receiver. There’s nothing like two days on a bush clad island full of the most beautiful birdsong to reboot both the body and the mind. 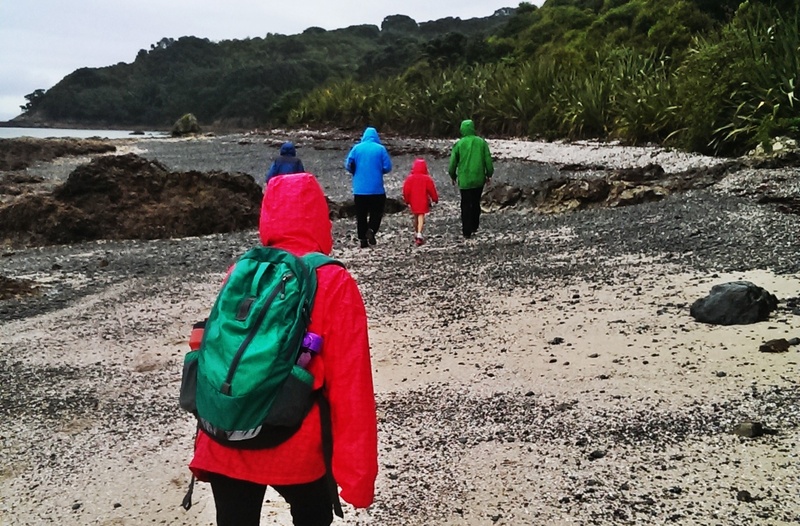 We went to Tiritiri Matangi – a bird sanctuary on an island just off the Whangaparoa Peninsula. You can take a ferry from Auckland CBD which takes about 75 minutes, or drive to Gulf Harbour (where there is plenty of free parking, and a drop-off zone makes it easy to get gear from your car to the ferry) and pick the ferry up there for a quick 20 minute ride across the water. 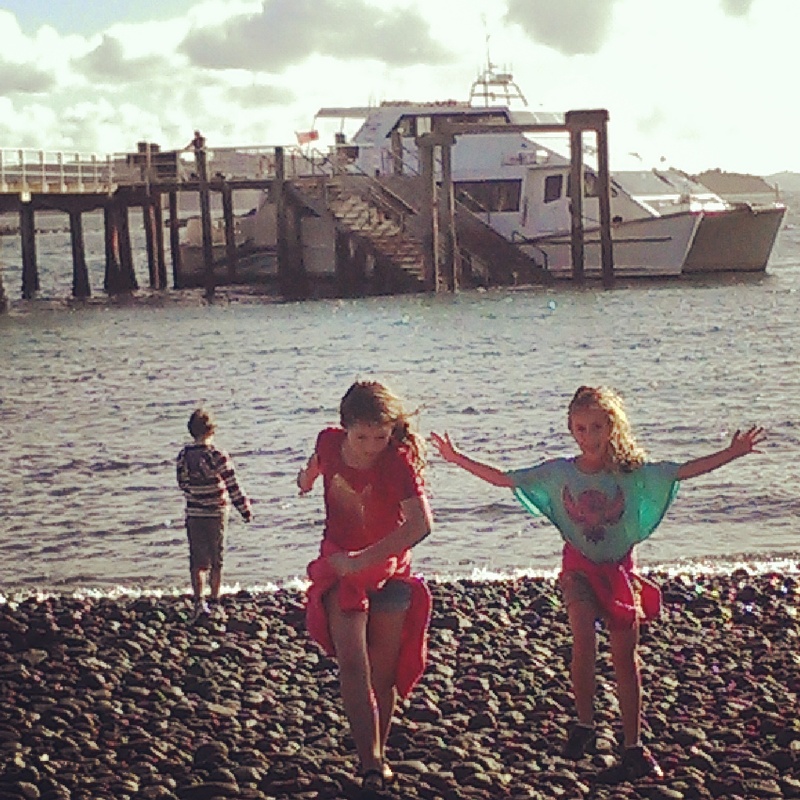 Most people visit Tiritiri Matangi on a day trip, but there is accommodation for those that want to stay overnight (which is what we chose to do). In true DoC style, the lodge is basic but well equipped, and staying the night means you get the added experience of going out after dark to spot Kiwi in the wild and watch the blue penguins coming home for the night. Tiritiri Matangi is just off the Whangaparoa Peninsula, north of Auckland. The weather forecast was pretty dismal so we arrived on the island fully geared up and ready for whatever the weather wanted to throw at us. Our bags and all the food we had brought with us were whisked away to the lodge, leaving us to carry just only what we needed for the day. After a short biosecurity briefing, we headed off along the beach and climbed a steep track into the bush which has been planted as part of a restoration project to turn the island from cleared farmland into a bush clad bird sanctuary. Within minutes we were surrounded by birdlife – saddlebacks, stitchbirds, whiteheads, tui, keruru, kakariki, fantails and more – all in their natural habitats and all happy to perform for their human audience. It wasn’t long before we’d ticked off most of the 32 birds of our list. We heard the bellbirds before we saw them. There were at least 20 of them gathered around a feeding station, drunk on nectar and singing their little hearts out [click on the sound bar below the image to listen]. If we thought that was magical, there was more to come. 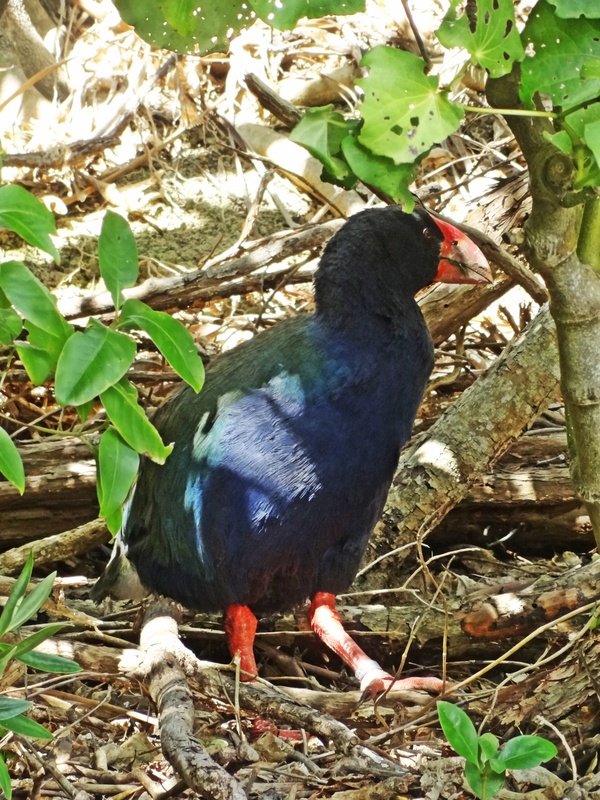 There are only about 200 Takahe left – making them one of the rarest and most endangered birds on the planet – so we felt very special to be able to spend time with a family of four of them who have very handily taken up residence around the visitor centre. The Visitors Centre is a great spot for lunch. There is free tea and coffee, a gift shop to look through and an education room where you can learn all about the history of the island and the work behind making it a sanctuary for our native birds. 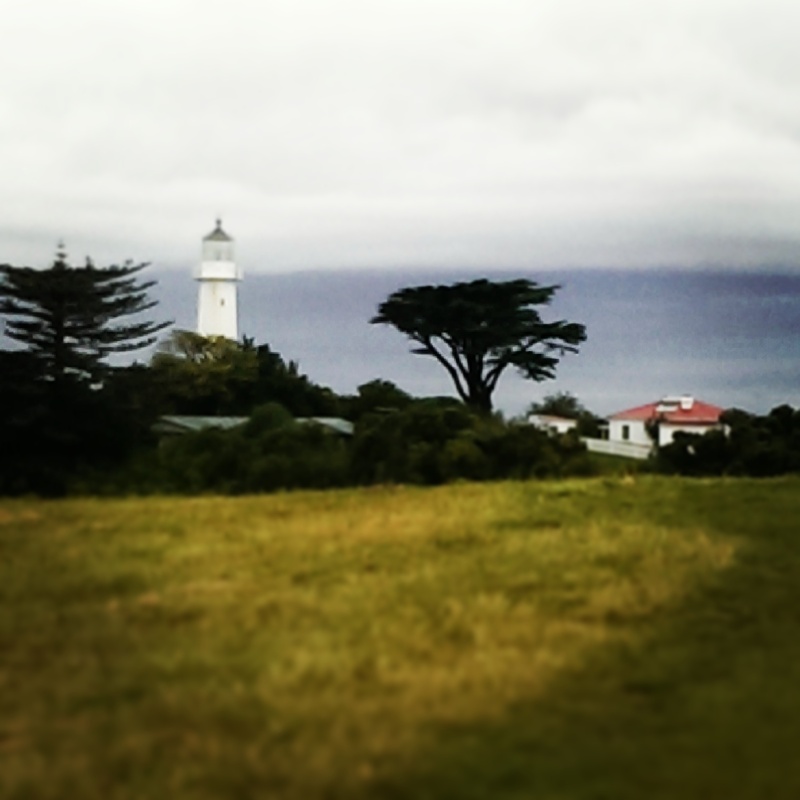 There’s also a lighthouse to explore. We checked into the lodge and, after dinner, covered our torches in red cellophane and headed into the bush to see if we could find any Kiwi. Half way down the track we found a little spotted kiwi which we were able to watch and track through the bush for a good 5-10 minutes. I’ve seen plenty of Kiwi in my time, but to see one wild in the bush is something else again. After a hearty breakfast we set out to walk the much more exposed Eastern side of the island. While there were fewer birds to spot the scenery was more spectacular and the tracks less crowded. We were accompanied the whole way by fantails who danced around us scooping up all the insects we were disturbing as we walked. The eastern side of the island is more exposed but also more scenic. After lunch back at the visitors centre we set out on our final walk. We had two birds left on our list – a Morepork (which we had on good authority would be nesting in the Nikau palms on the track back down to the ferry) and the North Island Kokako (another rare and endangered bird). It was our lucky day – the Morepork was exactly where we were told it would be, and as we rounded one of the final bends in the track we came across a very excited group of people who had spotted a lone kokako. A Morepork (Ruru) and a North Island Kokako completed our list. Waiting for the ferry home. As we waited to board the ferry we knew this was one experience we would definitely be repeating. While it does take a little bit of planning and organisation, it’s a great place to escape the city without having to go too far. The walking isn’t too arduous and there are plenty of places to stop and rest. For an extra $5 you can be accompanied around the island by a volunteer guide who will take you to all the best spots, point out all the different birds and fill you in on the islands colourful history. Go to Tiritiri Matangi – whether it’s a day trip or overnight this is a truly magical place, and a great way to recharge your city-weary batteries. Ferry tickets are available on the 360 Discovery website but your lodge bookings need to be organised through DOC. The island is a predator free bird sanctuary so there are rules you need to follow. Make sure every bag you take onto the island is able to be zipped up or otherwise closed. This is to ensure no unwanted bugs, mice or skinks smuggle themselves onto the island. If you turn up with unclosed bags you may be asked to leave them behind. You also need to check all your gear before you go – ensure there are no rogue seeds in your jacket pockets, clean the bottoms of your walking shoes and shoo any stray mice or lizards out of your day pack. Become a Friend of Tiritiri Matangi – it’s just $25 per family per year and you’ll get accommodation in the lodge half price, off season discounts on ferry tickets and the chance to get involved with projects on the island. You will need to take all your own food – lunch and snacks as well as dinner & breakfast if you are planning on staying overnight. The only things available on the island are drinking water, tea and coffee. If you are staying overnight there is a kitchen in the lodge which is fully equipped – except it no longer has a microwave (it drains too much power from the islands solar power resources). You can take as much food as you like – your bags will be transported from the ferry to the lodge and there are fridges and freezers available so there is no need to skimp on food. All of your own food (even if you are just going for the day) – and you don’t need to skimp as your lunch will be transported from the ferry to the visitors centre so all you need to carry is some water and a snack. There is free tea, coffee and drinking water available at the visitors centre but absolutely no food for sale. Hiking gear: good, solid walking shoes and a rain jacket are essential any time of year. Take a sunhat if you are walking the eastern tracks as that side of the island is much more exposed. A torch and some red cellophane if you are staying overnight. The light from a torch can scare or blind night birds so covering it with red cellophane is a necessity. There is usually some available in the lodge but it wouldn’t hurt to take your own. Some money. They have a great visitors centre full of bird related bits and bobs, with all proceeds going to fund the running of the bird sanctuary. We bought a nectar feeder for the Tui’s who sometimes visit our garden. A robust bladder. There are only three toilet blocks – one at the ferry landing, one slightly further along the beach and one at the visitors centre. If you are planning on walking for several hours make sure you go before you go. Get more ideas on giving the gift of an experience. Tiritiri Matangi is definitely a spot I would love to visit. I like that you can stay over night too, you have inspired me to make some plans for when the weather is warmer. Definitely worth the effort Jess. I’ve lived in Auckland for 20 years and never been before, but I think this is a spot we will visit regularly now. Especially as Miss 8 is rather fixated with birds. Next PostWhat a tree taught me about life.